Merope is a blue-white B-type subgiant with a mean apparent magnitude of +4.14. Richard Hinckley Allen described the star as lucid white and violet. It has a luminosity of 630 times that of the Sun and a surface temperature of 14,000 kelvins. Merope's mass is roughly 4.5 solar masses and has a radius more than 4 times as great as the Sun's. It is classified as a Beta Cephei type variable star and its brightness varies by 0.01 magnitudes. 23 Tauri is the star's Flamsteed designation. 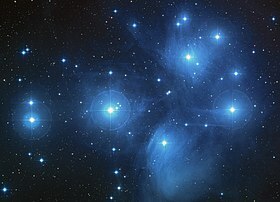 The name Merope originates with Greek mythology; she is one of the seven daughters of Atlas and Pleione known as the Pleiades. In 2016, the International Astronomical Union organized a Working Group on Star Names (WGSN) to catalog and standardize proper names for stars. The WGSN's first bulletin of July 2016 included a table of the first two batches of names approved by the WGSN; which included Merope for this star. It is now so entered in the IAU Catalog of Star Names. ^ a b c d e Van Leeuwen, F (2007). "Validation of the new Hipparcos reduction". Astronomy and Astrophysics. 474 (2): 653. arXiv:0708.1752. Bibcode:2007A&A...474..653V. doi:10.1051/0004-6361:20078357. ^ Ducati, J. R (2002). "VizieR Online Data Catalog: Catalogue of Stellar Photometry in Johnson's 11-color system". CDS/ADC Collection of Electronic Catalogues. 2237. Bibcode:2002yCat.2237....0D. ^ Slettebak, A (1982). "Spectral types and rotational velocities of the brighter Be stars and A-F type shell stars". Astrophysical Journal Supplement Series. 50: 55. Bibcode:1982ApJS...50...55S. doi:10.1086/190820. ^ Merope, Star Names and their Meanings, Richard Hinckley Allen, Dover Publications, 1963, p. 407. Wikimedia Commons has media related to Merope (star). NGC 1435 - Merope Nebula LRGB image with 4 hours total exposure. This page was last edited on 2 February 2018, at 13:35 (UTC).